It’s a Date! (or is it a fig?) – Our Favourite Things! I love dates and figs and while they look sort of similar on the outside, they are different fruits. Dates are a fruit from the date palm tree, and have an edible sticky flesh that surrounds the pit. Figs are also a fruit from a fig tree, and have hundreds of edible tiny seeds, making it a crunchy yet soft fruit. Dried figs are dark in colour and have a seedy-crunchy-jammy texture. Nutritionally, dates and dried figs can be considered a concentrated source of energy. As with most fruit, the fresh version will be lower in calories as it still has all its water content present. 1) Versatility: Both dates and figs are great as snacks, appies, main meals and desserts. Any food that pairs well with both chocolate and cheese should be considered a super-food. 2) Quick Snack: Both are an awesome quick snack. Being the foodie that I am, I would combine dates or dried figs with raw walnuts, aged crumbly white cheddar and a nice seedy cracker. 3) Appie–Dates: Remove the pit and replace with a walnut or pecan and a skiff of blue cheese. 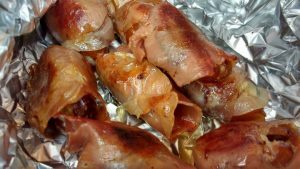 Wrap date in prosciutto and broil for 5 minutes, turning once. Serve with drizzled honey. Delectable. 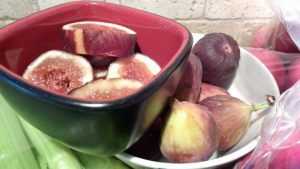 4) Fresh figs on Pizza: I buy these at Crossroads Market in the summer, but they don’t last very long as I am the only one in my house who loves them. This year I ate what I could and froze the rest whole in a freezer-safe bag. They slice beautifully when partially thawed, and are excellent on pizza with pancetta or prosciutto and gorgonzola. 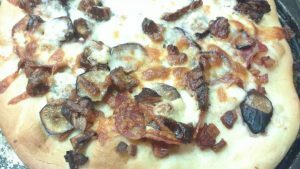 Dates and dried figs work beautifully on this type of pizza as well and the flavor combo is amazing. 5) Mealtime with Figs: I was inspired by our own Andrea Holwegner to make Chicken Marbella from “Whitewater Cooks”. I have made it a few times, and it’s full of wonderful aromas, flavours and textures. Such a great recipe to try if you love that savory-sweet combination. 6) Two words: Duzu Dates. They are dipped in chocolate and not just any chocolate…Bernard Callebaut Master Chocolate with a sprinkle of sea salt with an almond in the middle instead of the pit. Check out the links below and FIND THESE DATES! Do you have a favourite way to enjoy dates or figs? We’d love to hear them in the comments!